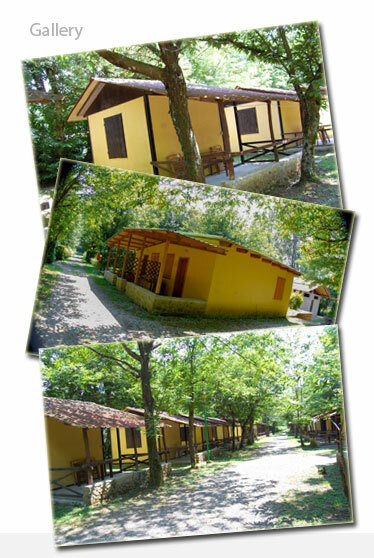 The campsite offers 16 wooden bungalows (10 bungalows that can accommodate max 4 people and 6 bungalows that can accommodate max 6 people) plus 2 mini-apartments. 4 pax bungalows with kitchenette and toilet but no hot water and no shower. Showers are placed outside in the communal areas and work with 1,00 Euro coins. Hot water coins cost 0,50 cent. 6 pax bungalows with kitchenette, toilet, shower and hot water. 6 pax bungalows with hot water, kitchenette, toilet and shower. miniapartments can accomodate 4+1 and 4+2 pax with fully equipped kitchenette and bathroom. All the bungalows and mini-apartments have an outdoor veranda with tables and chairs.